Supanova 2019 with Hugh Keays-Byrne of Mad Max fame is coming to the Gold Coast April 12-14. As tempting as it is to drop the kids off, come along to this wonderland of awesome people and well-priced memorabilia. Just go; even solo it's epic. It was my son, a young actor himself, who convinced me Supanova was super amazing. 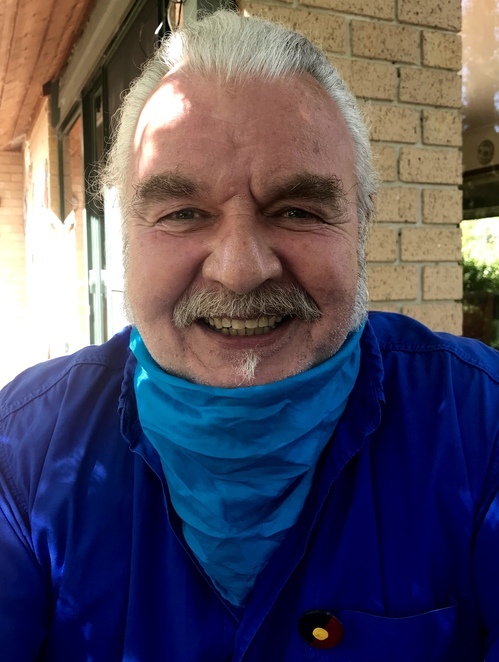 This year I was given the absolute pleasure to interview esteemed actor and Logie winner, Hugh Keays-Byrne, whose career has spanned the Mad Max historical landscape from the maniacal Toecutter to Fury Road's Immortan Joe. This cinematographic feat was of Shakespearean overtones and no coincidence given Hugh's six years with The Royal Shakespeare Company in the UK. Yes Australia, we are so fortunate to have acting royalty skillfully bought across to cinema by Hugh and director George Miller. Hugh only recalls his early family life in Srinagar via stories from his family; about the beauty of the place and his attachment, and reminisces about his time in a boys boarding school. As Hugh is a living legend who has vast experience of this world, I was keen for his words of wisdom, firstly for all of us, then for young aspiring actors. He stated that it's possible, no matter your early years or upbringing, not to be beastly; that one can change and not be beastly. Hugh states he has been with his partner for 45 years (how wonderful and congratulations to both of them!) and describes her as a socialist and himself as a monarchist. 'Huge difference is possible' without a fight, says Hugh. Speaking on behalf of Immortan, Hugh conveyed that his character was not a dictator but in fact 'trying to improve things' in a post-apocalyptic planet by giving everyone what they wanted; cars, big V8 cars, and credited the script for not having to look anywhere for further inspiration. Immortan was described as a redeemer who came out of an apocalypse with a colonial view; an opportunist. 'He (Immortan) sees himself as a decent sort of a chap; he sees himself as restoring order'. Hugh draws a parallel with the current state of the world and the injustices recently bough to light for men, women, indigenous people, animals and the planet in particular. This core belief of immortality and the right to rule was masterfully imbued by Hugh and all involved in the production of Mad Max Fury Road. I asked Hugh for his advice to his 18 year old self, and 18 year olds of today and if that differs. He paused and thought deeply and responded with this gem; 'You can do no wrong; just trust yourself, the chances are, you know what's what. Most people I've come across in my life are decent sort of people and they want to do the right thing. The few that are freaked out... are the ones that need the hugs'. Hugh feels the need to 'punch one's way through' is just not serving us at this time. On asking Hugh his favourite character, film or role, I received a simply gorgeous response. "I always feel inferior to nurses and health workers; those who are on the front line', and credits his wonderfully varied career to 'the luck of it' and that he's never had to do a 'proper job'! I'm honestly looking forward to seeing Hugh at the Supanova Superhero Parade this year which is a publicly accessible highlight of the weekend. The international fame of Mad Max and the brilliance of director George Miller- these are Australian's living screen legends. My first Supanova saw me parking the car, expecting a day following a very happy child around. Right there was a literal fandom of cosplay humans flowing from cars and nearby streets and I started smiling..and laughing, and getting excited myself. This was a joyous holiday from the usual adulting. I've enjoyed a number of Supanova's since my first one years ago in Melbourne and in recent years attended Supanova Gold Coast. The activities are jam-packed, providing some of the best value tickets at this end of the universe. The queue to get in was orderly and worked quickly; the sight of all the hard work, sometimes a whole year's work on costumes, made the entry phase one of the entertainment itself. Once in, the range of activities was mind-blowing- books, art, hands-on model making (incidentally sparking a life long interest for our family after being gifted the model we made), anime previews and special screenings, famous actor appearances and signings and a costume parade was amongst many others. We bought gifts for friends and family, memorabilia not available elsewhere, and at one I bought very warm army jacket that has been constantly used in volunteer whale research. Take a look at the following action-packed Supanova site for all the epic information and I'll see you there soon. Get in early for tickets online to maximise your time. Get your tickets online now, save time at the door. Click on the following links to check out the comprehensive Supanova site for tickets, information, accessibility information, sign up to their newsletter, Cosplay competition, the Superhero Parade, see confirmed guests and online competitions. Why? Because the world needs an infusion of joy right now. Let's all come to Supanova and celebrate loved celebrities; and life itself. When: 5PM to 9PM Friday, 12 April. 10AM to 6PM Saturday, 13 April. 10AM to 6PM Sunday, 14 April.